Are You Listening? Or Are You Just Doing A lot of Talking? My horse, Bert can be extremely sensitive to the cues that I give him. (Cues are the promptings you give a horse to do what you need or have asked them to do.) There are several ways to cue a horse. You can use your voice or your hands and legs. If I apply pressure with my right leg to my horse’s right side, I am cueing him to move against the pressure and to move towards the left. When using my voice to cue, I say the word “Whoa!” loud and firmly. This cue is given when you want your horse to come to a stop. We may expect that God only speaks through loud, dramatic signs like burning bushes and manna from heaven. But maybe we have forgotten or become desensitized to His voice – His cues. Or have we just stopped listening? John says that we “listen,” not that we “listened” in past tense or that we “will listen” in the future. He says, “listen to Me” in present tense. This is a continued action we must be conscious of daily, not just a one-time thing. This needs to become a part of our daily life and routine. If we look at Hebrews 4:14, we read, “For the word of God is living and powerful.” God’s word is alive – it’s not dead. It is active! It has life, action and motion to it! We need to put our listening into action. When you are pouring your heart and guts out to a friend, family member or spouse and they continue to interject with advice and similar circumstances that have happened in their own lives, by the end of the conversation, you walk away feeling that maybe they were never really listening. They were too busy trying to speak that they didn’t take the time to listen. I find myself doing this with God! I want to hear from Him but at times I find myself going to my quiet place with every intention of listening but instead spend the time talking and interjecting. It is hard to hear Him when we allow our own voice to become louder than His voice. Have you ever been in a situation where it seemed that God was no longer present? Maybe it was in your marriage, raising teenagers or a difficult work situation. You sat there with tears running down your face and yelled, “God, where are you? I don’t understand! Why aren’t you speaking to me?” But maybe the harsh reality is that He was speaking but we weren’t listening or couldn’t decipher His voice. A year ago, almost to the day, my husband and I felt that God was telling us to sell our current house and look for a new house that would allow for us to build an addition with the intent of eventually taking in some close family members. We both knew that we heard God’s voice and stepped out in faith to make the move happen. From the moment we said “yes,” it has been one hardship after another to the point where you question if you ever heard God in the first place. I mean, if you heard Him correctly then why were so many things going wrong? If we were being obedient then shouldn’t things be going smoother, easier? I am here to admit that I questioned God during this last year. I questioned myself if I did really hear Him or was my voice louder than His voice? At any point throughout this last year, many would have understood if we threw in the towel and said we heard Him wrong. God didn’t say, “Build an addition.” He said, “Study to be a mathematician.” So easily confused, right? Not only did we question His voice but others around us did as well. With so many things going wrong, God could have been telling us to go a different direction, right? Well, I am here to tell you that when God calls you to do something it doesn’t mean it will be easy. It doesn’t mean it will go smooth. It doesn’t mean things are perfect. But, it does mean we are to be obedient because He sees things that we can’t see. He knows things we don’t know. And if we are actively listening to His voice, He will lead us every step of the way. We can hear His voice through our current circumstances. When Sean and I look outside our windows and see that the addition finally being built, I hear God proclaiming that He is faithful! We can hear His voice through a donkey. In Numbers 22, we read how God used a donkey to speak to someone. God uses many ways to speak to us – creation, other people, pastors, sermons, inner conviction and even dreams. The question is not if God is speaking but are we listening? Lord, I pray that you will open our eyes to see, ears to hear and hearts to respond to your whisper. May our communication with you be sharpened and heightened. May we never become desensitized to your guidance and prompting. May we tune in to your voice and drown out the distractions. Take time this week to tune out all the other voices and to lean in to what God is speaking to you in this next season. Journal what you hear God speaking to you today! 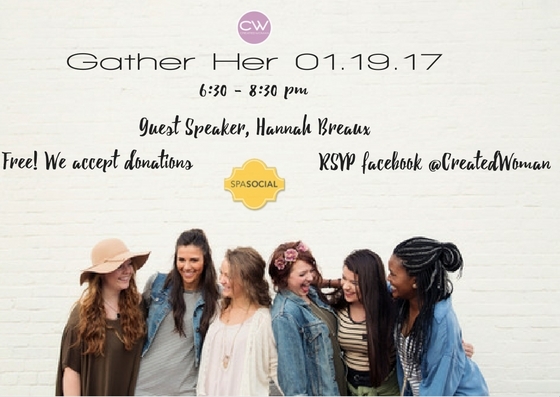 CREATED WOMAN KICKS OFF 2017 IN STYLE! Style Speaks IV! Click HERE to get your ticket!